Auditions will be Monday, November 12, 2018 at 7:00 pm at PowPAC, Poway's Community Theatre. The Theatre is located in the heart of Poway at 13250 Poway Road, Poway, CA 92064 (Upstairs in the Lively Center). There is elevator access, with parking, at the rear of the building; accessible at the west end of the building. 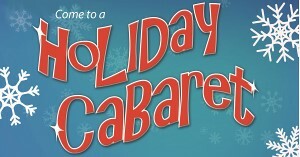 Holiday Cabaret will perform Thursday, December 13th, Friday, December 14th, and Saturday, December 15th at 8;00 pm and Sunday, December 16th at 2:00 pm & 8:00 pm. No stipend is offered for this fundraiser. Please bring head-shot and resume, if available. For the audition, you can come with a prepared story to share or read one provided at the audition. Those auditioning to sing, please bring sheet music for Accompanist; or with music accompaniment on your phone or electronic devise. Director Leigh Scarritt is looking for Singers, Storytellers and Stories for Holiday Cabaret, a fundraising show benefiting PowPAC, Poway's Community Theatre. Ms. Scarritt is planning to incorporate stories (traditional and original) into the flow of the show to create a well-rounded Cabaret of Song, Dance, Story, Laughter, and Thought. We are also looking for someone to portray Santa Claus; interacting with guests in the lobby before the show and reading a story on stage during the show, as well.